Every story of any artist has a beginning. In my case my first drawings came from other peoples photographs. My sense of achievement was limited to having captured a likeness of the photo. I set about getting my own reference where the choice of light, angle, … was all mine. I wanted my art to be all mine. Many of the animals that fired my passion I had only seen in zoos, books, and movies. My vision of them as wild creatures was limited to the experiences of others. As my work progressed I strived for more than just a likeness of a particular photo. I made changes to lift the image to add what I saw as the essence of the creature. 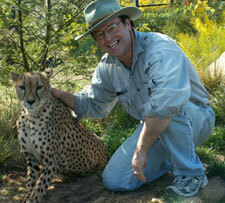 Despite my passion for African animals I had not experience them in the wild. The instant fire from your first wild sighting will change you! It lifts your courage, your expectations and passion to capture what you have seen and experienced. You notice things that surprise you, make you smile, gasp and your heart beat faster. Your expectations for your art will be raised by your experiences. I talk to people who buy my paintings about my experiences. Nearly all buy my paintings because my work brings to life their personal encounters. I have no doubt that knowing my personal experiences with the creatures adds to the pleasure they get from my paintings. I have seen the changes in confidence of the people who have travelled with us to Africa. Many would not have made the journey without Steve and I to allay their fears. It gave them courage and confidence in themselves that changes their lives and their expectations of their art and photography. I smile when I hear them proudly sharing their stories of close encounters with elephants and lions. They have a confidence that contrasts with the trepidation I saw on their faces the first time an elephant got close and then a whole herd. This heightened experience lifts their courage and expectations for their art and life. They are different, they glow with confidence! If you want to paint wildlife see painting from other people’s photos as a step along the way. If you want to improve your paintings nothing comes close to a personal wild encounters. A month in Africa can cost as little as $4500 including flights. It will change your life and your work. I still have my first drawings of elephants done from other people’s photographs. At the time they gave me the encouragement to keep drawing. I now have 7500 photos of elephants some dramatic, some playful and some stunning. My elephant experiences are too numerous to count. I was proud of those first drawings but my expectations and skills have moved on. Without those first drawings and others of zoo animals I would not be an artist, wildlife artist, art teacher or African tour guide. Those first tentative steps changed my life. They were however just a step not the whole journey. My first drawings from other people’s photographs and experiences were the beginning of a journey. Even if they were admired by others they were not all mine. 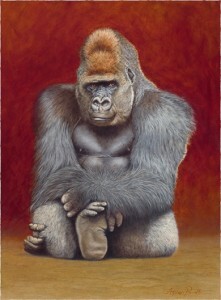 The gorilla painting attached was taken from my reference taken at the zoo. I still love the painting but when I talk about it now I always include my face to face experience with the wild gorillas of Rwanda. I’m sure that for gallery visitors my zoo painting is enhanced by wild encounters. My vision of gorillas was changed by the contemptuous look a huge silver back gave me as he passed ‘very’ close by. I have no doubt that my next gorilla painting will be enhanced by the wild experience and the satisfaction I get will be also be greater. If not for the use of other people’s photographs I would not have taken my first steps as an artist. My drawings were improved by the qualities of these photographs. This early achievement was essential to encourage me to continue with my art. It was however just a step along the way. With every step and wild experience there comes a greater expectation and your work will reflect it. Without other people’s photographs and zoo animals I may not have begun. But it was just a beginning! This entry was posted in Painting, Uncategorized, Wildlife, Wildlife Artist. Bookmark the permalink.